50 individual bags of our all-natural Mouse Away Solids, made using our exclusive Mouse Away formula that combines pure Peppermint Oil with pure Spearmint Oil in just the right combination to provide maximum repellency. These are also available in Bulk 100. Mouse Away Solids do not harm rodents at all - they simply hate the smell of Mouse Away and move away ASAP. The essential oils of Peppermint and Spearmint smell so wonderful that it seems almost a shame to use them for chasing away mice and other rodents but, Mouse Away Solids work. 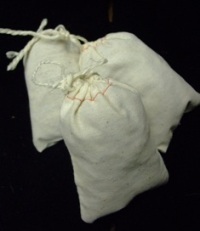 The Mouse Away Solid pouches are small cloth bags filled with about 4 ounces of an inert material infused with Mouse Away Concentrate. Just toss the pouches under cabinets, into basement corners, into attics, under porches, etc. The pouches are especially useful in keeping mice from nesting between the inner and outer walls of hot tubs. You can use our Mouse Away Concentrate to "recharge" the pouches every few months. Note: For very bad infestations, it is best to use our non-lethal Mouse Cubes and trap out as many as possible first. "Winter use of Mouse Away in RV's"
Review: We've been selling Mouse Away for going on 10 years now and have not had one instance of complaint from our customers use of the product in RV's. Thanks for a great product. Review: I love it, sense I've been using these, I haven't seen a mouse. I do have a question, how long do one bag last, weeks, month. The bags should last approx 4 weeks before you need to add more mouse away concentrate to keep the aroma really potent.